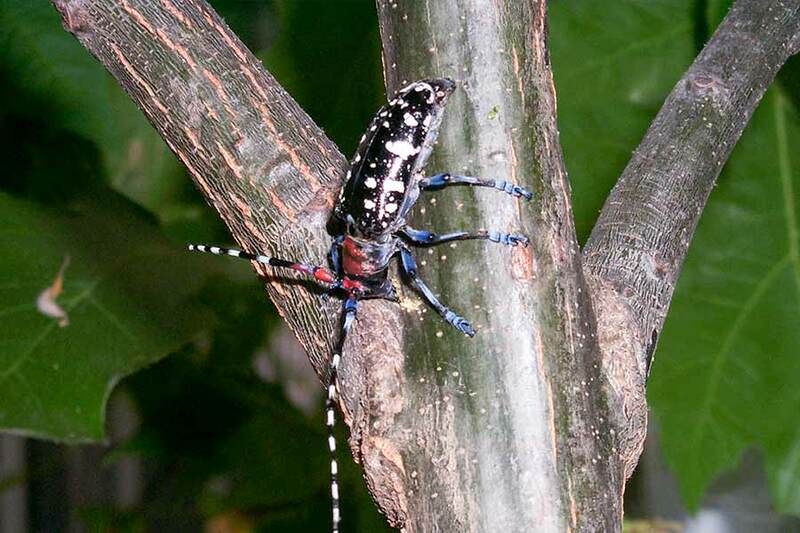 The destructive Asian longhorned beetle was first discovered in New York in 1996. Adult beetles are usually 1–1½ inches long with shiny black coloring and random white spots on their bodies. These six-legged insects are named for their long, jointed antennae with white bands. Adults are most active between midsummer and fall. Larvae tunnel into trees, cutting off the movement of water and nutrients, usually killing the tree. Common trees attacked include birch, goldenrain tree, willow, horse chestnut, elm, katsura tree and maple. Thousands of trees have been killed so far, and there is real potential for further damage, especially to valuable woodland and urban areas. 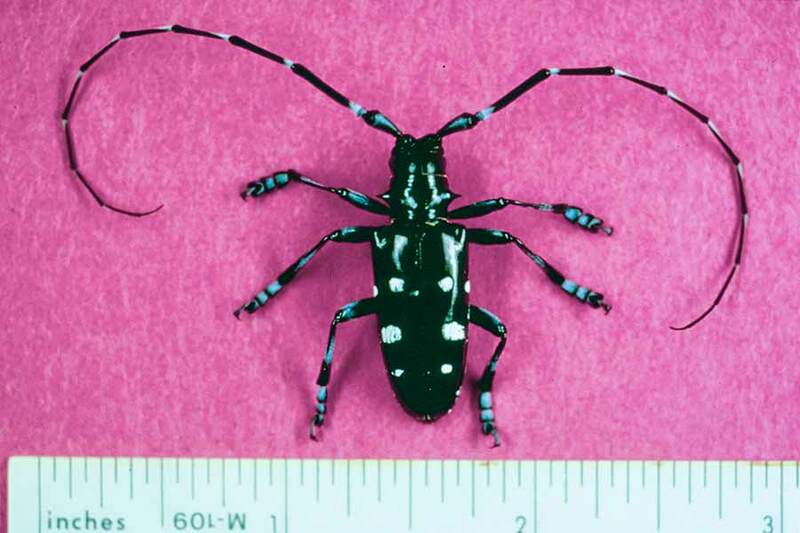 A study by the USDA Forest Service determined that if the Asian longhorned beetle became established across the country, it would probably kill 30% of all urban trees — at a compensatory value of $669 billion. The beetle has spread throughout the northeastern and midwestern United States. Quarantines are in place in Massachusetts, New Jersey, New York and Ohio in an attempt to stem its spread. Be on the lookout for damaged trees and beetles, especially in mid to late summer. Early signs of infestation include yellowing or drooping leaves, oozing sap, dime-sized exit holes in trunk and limbs, shallow scars in the bark and sawdust material where branches meet other branches or at the base of the tree and dead limbs. Report suspicious findings to the USDA at Asianlonghornedbeetle.com. To report a possible insect problem and find out about potential treatments, please contact your local extension service, certified arborist or professional nursery. Do not move any regulated material such as firewood, nursery stock, wood debris or lumber from host trees. Do not move firewood. Purchase firewood in the area where you plan to burn it. Allow officials access to your property for inspection and, if necessary, eradication work. Move brush, leaves and twigs of regulated materials that are less than 1/2 an inch in diameter to approved disposal sites. Call your State ALB Program for a disposal site near you. When planting a tree, choose from the UDSA’s list of recommended trees. 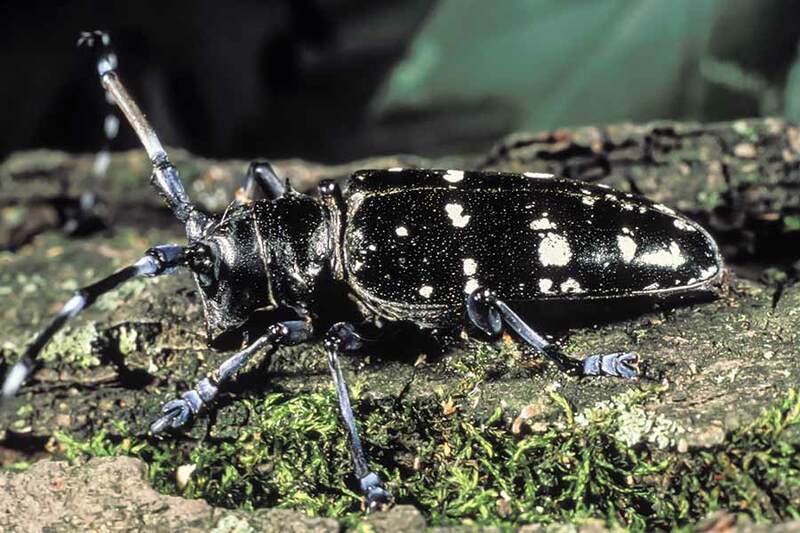 The UDSA’s site, Asianlonghornedbeetle.com, provides the most in-depth and up-to-date information about this beetle and what to watch for.